this wasn't the first election to have that. I've never heard of her nor do I know any of her music but I may have to buy some of her music for the heck of it. I feel the same way about Kanye although I do know him and some of his music. It may seem silly and trivial but it wouldn't be a bad idea to support the careers of some of these artists who traditionally would never support MAGA even privately much less come out and publically support him in such a bold way. It only takes a few of these music artists and/or actor/actresses to survive having their careers ruined for bold, public MAGA support to open the floodgates to more Hollywood types to come out in support. Lol, I don’t think I’m right. I know I am. Let me put this in another way. Let’s say the human race is a body, a single entity if you will. Now then each and every human is a cell. A healthy body is one in which every single cell is working properly and is being self sufficient. Suddenly some of the cells start to undergo mutations and instead of being self sufficient contributors to the body, they become lethargic and parasitic in nature. These cells which once were contributors to the entirety of the body now take up energy and then give nothing in return. This starts off with a few cells (people), but it eventually spreads. Soon so many cells (people) have this lethargic parasitic behavior that it begins to take a toll on the body. Eventually the cells which are still contributing and working begin to break under the increased load brought on by the lazy, lethargic, parasitic nature of the cells that are now exponentially increasing in numbers everyday. If something isn’t done, the body (human race) will fall. What I’ve just stated is the nature of each side of the political arena. You, the parasitic, lethargic, lazy are taking much and contributing nothing. What I’ve laid out is also the same way that cancer kills people. People like you are a cancer. Don’t believe me? Look up how cancer kills.. I judge liberals on the policies that they think they are entitled to other people’s fruits for their labor. Ok, well I am not a white supremacist.. but go ahead and label me..
Joy Vila is cute; she's got the right stuff, but I don't like her dress. I have to believe she's mocking President Trump. I have to believe she's mocking President Trump. Tell us about the caravans not reaching the border. Whatever bull shite you are pulling out of your arse here is just as wrong. You are eaten up with butthurt. Why would you want to hide that? What more work are you having to do because of the lethargic people? I'm just curious. Exponentially increasing numbers? You really are very fearful. You can tell by the bad sci-fi and terrible exaggerations. If anything meaning of you conservatives and Trump supporters are the cancer cells in a body. Cancer cells multiply and only work hard for themselves. They keep amassing until they kill the entire body. That actually sounds more like you than it does anyone else though I will agree that there are some people in the poorest regions that are also cancer cells. You, the parasitic, lethargic, lazy are taking much and contributing nothing. Be specific and tell me which people are being parasitic and how. Really elaborate please. judge liberals on the policies that they think they are entitled to other people’s fruits for their labor. This is such an idiotic over-simplification. I love how you guys cry for people making over 10 million dollars a year. We live in a society in the fact that they can afford lots more money is plenty reason why they should contribute more. After all, it's kind of arbitrary that the CEO of a company to get paid a vastly superior salary to the mechanical engineer that designed the product you guys act like salary is ordained by heaven. A lot of modern-day right-wing people are so scared of the white man becoming irrelevant that they're lashing out. " Like it or not, as a group, white men are at the top of the food chain. What we're AFRAID of is having to come in and clean up the inevitable fking mess that will be created when we finally say "fk it, you idiots run things a while" because honestly, you're not capable of doing 1/1100000000 the job. If anything meaning of you conservatives and Trump supporters are the cancer cells in a body. Says the guy that underpays his employees, brilliant! Literally what you said is white supremacist. So was Omarosa, til she became anti-Trump. 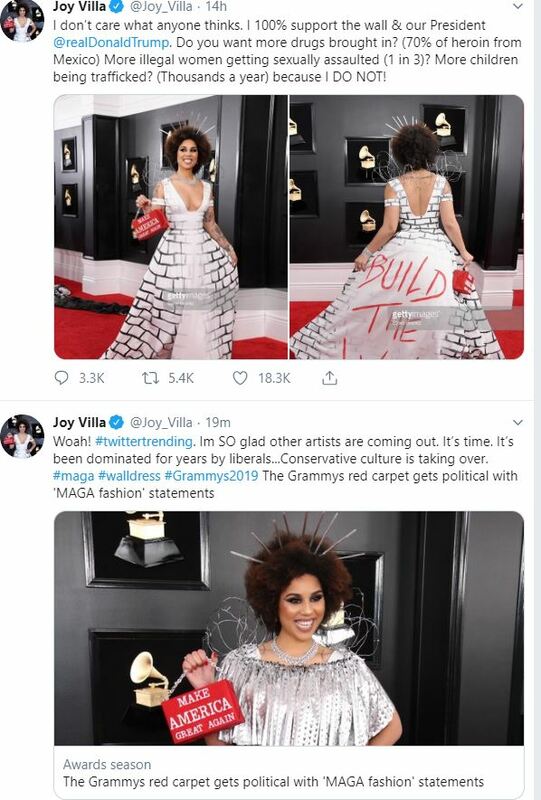 Will the real Joy Villa step up to the plate, please? I know that even in 2019 people of color live unimaginably difficult lives of oppression at the hands of white devil, but at least they get to wear MAGA stuff in public without consequences. Will the real Joy Villa step up to the plate, please? She already has. The last two years she's dressed in support of President Trump. Does that bother you?